The Apple Watch isn't hurting for software, and now it can count main rival Google as a member of its 3,500-strong app army. Google updated its News & Weather app for iOS today, bringing with it support Apple's wearable. There's nothing fancy about it and it likely won't be Watch owners go-to for news and weather, but it's something, right? 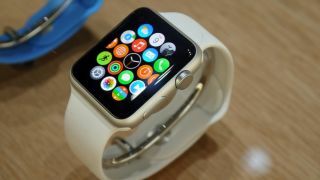 With the app, Apple Watch users are treated to a swipeable menu of headlines with accompanying images, though no articles or story summaries. While you can't read the actual news or even Handoff it to your iPhone, you can save it to your Safari Reading List via Force Touch. Google News & Weathers culls from 65,000 publications and categorizes them, so users will get a wide breadth of news from a multitude of sources. Weather alerts aren't part of Google's Watch offering, either. For an initial foray into a competitor's wearable space, it's about as basic as it gets. But perhaps bigger and better things are to come.